Ender's Game was based upon the book of the same name by the author Orson Scott Card. I had not read the book so I watched the movie with no preconceptions. There were some people who said they would avoid the movie because of Card's political and religious views but as a fan of H.P. Lovecraft it takes a whole lot to get me to boycott art, as has been discussed before. Although I can't say for sure I think that there was a lot left out from the book. There are a lot of dead ends and things left unexplained in the movie that I imagine might have been clear to me had I read the book. 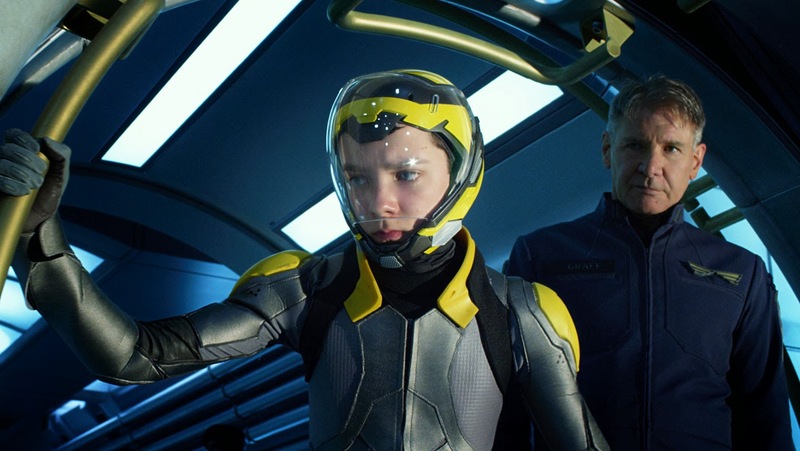 In some very real ways Ender's Game is a morally didactic movie. It definitely has a message of tolerance and understanding. All the same the message is muddled and bent. Perhaps it's the problem of translation from one medium to another. Perhaps it's the danger inherent in having child actors, although I doubt it. The young man playing Ender is pretty accomplished in his field, despite his youth. I also doubt it's the director as he has won Oscars for some of his previous work. Maybe it's just the sadness and a little ugliness in the source material. I'm not sure. I am sure that this was not a must-see film despite its A-list cast and impressive special effects. In the not too distant future Earth has been attacked by a race of interstellar insectoids known as the Formics. Millions of people die. The Formic invasion is only halted by the self-sacrifice of pilot Mazer Rackham (Ben Kingsley), who just like Randy Quaid in Independence Day, rams his aircraft and its payload into the unprotected belly of the Formic mothership, destroying it and causing other Formic ships to either crash or flee. Since that time Earth has been obsessed with the possibility of a new Formic attack. It appears that the military has taken political control from civilians and silly little things like nation states have dropped by the wayside. And parents need permission from the state to make whoopie or at least make the kind of whoopie that results in another human being joining this world. I don't know if this is from the book or not but that was my impression from the film. A new way of war is being propagated. I thought it barely made sense when you think about who spends time playing video games. The new style of warfare requires massively integrated intellectual capacities combined with fearlessness and intuition. These are characteristics which are disproportionately found among children. These children will be trained as if they are actual warriors but their "fighting" is done via computer screens from which they control drones, fire systems and ships with actual adult men and women in them. So the Armed Forces are always on the lookout for a few good boys and girls. One such boy is Ender Wiggin (Asa Butterfield). Ender combines a sharp intelligence with an appealing amorality, especially when he's placed in bad positions. He intends to win and will do what he has to do. As a young cadet he comes to the attention of Colonel Graff (Harrison Ford) and Major Anderson (Viola Davis) who place Ender in difficult circumstances to see how he responds. Something which appeals to Anderson but irritates/intrigues Graff is that although he can be extremely ruthless and pragmatic, Ender nonetheless has a well developed (and equally well hidden) conscience and just as strong of a dislike of any illegitimate authority. This kicks off a series of set action/drama pieces which sees Ender promoted to greater level of responsibility, have more intense training and have deadlier confrontations with bullies. Ender does not like bullies and does not like being manipulated. However the higher he rises in the Armed Forces the more he runs into both. Interestingly enough, perhaps because Ender is supposed to be even younger than he looks, there is no love interest of any kind. Ender's interest is primarily in ensuring the safety of his older/protective sister Valentine (Abigail Breslin) though he does make good friends with another girl who initially outranks him, Petra (Hailee Steinfeld). This movie features the slight Ender dealing some serious pain to bullies but at the same time I'm not sure you would root for the character in part because it looks like Ender also has some coldness/darkness within him that he struggles to keep on a chain. Ender could just as easily be the hero or the precocious kid that uses a graduate level knowledge of physics and chemistry to murder the entire school. Davis and Ford don't have a whole lot to do. Their characters are pretty much defined in the beginning of the film and don't change a whole lot. Davis' character worries about Ender's emotional wellbeing while Ford's role requires that he constantly snarl "I don't give a damn what he feels like. I need him trained!!" Sergeant Dap (Nonzo Anozie: Xaro Xhoan Daxos from A Game of Thrones) has a small role as the drill sergeant who must beat these kids into shape. There is room for a sequel to this film but I doubt there will be one. The big surprise is telegraphed too early. And as mentioned earlier it was difficult for me to empathize with anyone in this film. This kinda bothered me a little but it is what it is.